Charter schools could soon receive more public funds thanks to a measure moving through the General Assembly that would siphon dollars away from traditional public schools to charters’ coffers. A provision in Senate bill 456 would not only force public school districts to share as much as an additional $11 million worth of their sales tax revenue with charter schools, which are also public schools but function independently of local school boards and are not beholden to the same accountability measures —the bill would also require districts to create an additional layer of administrative bureaucracy in their accounting practices. That’s because under the proposed measure, local districts would have to create new, separate accounts for funds that include privately-made gifts, Medicaid reimbursements for special needs students and competitive grants—all of which are typically earmarked for various traditional public schools and are supposed to be handled through something called Fund 8. Fund 8 allows school districts to reserve those kinds of restricted grants and reimbursements for traditional public schools. SB 456 includes language that would undo this system of allocation that was recently recognized as an appropriate practice by an appellate court. In defending his bill, Senator Tillman said charter schools don’t want access to restricted grants — nor do they want PTA money or band booster money. Tillman acknowledged that with his proposed measure, districts would have to separately designate those gifts, grants or reimbursements in order to keep them with traditional public schools—and that practice, says Guilford County Schools Chief of Staff Nora Carr, is what’s actually calling into question the issue of fairness. Carr explained that, for example, Medicaid reimbursements for exceptional children (EC) by and large should go to traditional public schools, which serve the lion’s share of that student population. In order to make sure the reimbursements are directed to the schools serving EC students, the district would have to create yet another separate fund, creating more bureaucracy when the district is already dealing with very tight resources. She also explained that the local school district aggressively engages in competitive grant programs because in a time of austerity, it’s imperative they find other revenue streams to support the needs of their traditional public schools. “Most of these competitive grants are for a specific purpose to be carried out at our traditional schools,” said Carr, noting that the grants also include monies for indirect costs that are incurred while carrying out the grant-funded program’s purpose. 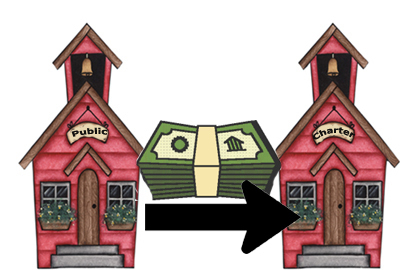 Charters must be in financial compliance if they wish to expand by one grade level. Read a summary of the bill’s changes written by legislative staff. The bill is now before House lawmakers for their consideration. There is no problem with moving the funds along with the students. The schools need to be able to use the dollars the parents pay. And heck, the traditional government schools get a heck of a deal when they have no student to educate but still get a portion of the total tax dollar allocation for the student that is not sitting in their school. Plus $11 million is a drop in the bucket compared to the traditional government schools, divide that by the ~115 school districts and you get less than $100k per district…or the funds for about 10 students at most. Almost twenty years ago, charter schools were begun with an educator’s idea that has been changing the face of public education. Obviously, there are many parents who like and choose charter schools for their children. They have cut public school funds to the bone already so what would cutting $100,000 more mean? No bus drivers or a few less secretaries? Who cares if no one answers the phone? It is obvious these things do no apply to you. 1. Please stop repeating this line “charter schools, which are also public schools but function independently of local school boards and are not beholden to the same accountability measures” unless you are prepared to detail what those accountability measures are. I’m a charter school principal and can tell you for sure we are just as accountable as any district school, if not more. Will a district close a school if they don’t meet growth 2 out of 3 years? Charters can be closed for that. My students take the same exams and my teachers are evaluated the same way as any district school. 2. This isn’t additional money being taken away from district schools. It’s money that once was supposed to be given to charters (the Sugar Creek decisions showed that holding this back was illegal). What changed is that the legislature made it OK to deny these funds.